Pip3line is a raw bytes manipulation utility, able to apply well known and less well known transformations from anywhere to anywhere (almost). Its main usefullness lies in pentesting and reverse-engineering / binary analysis purposes. 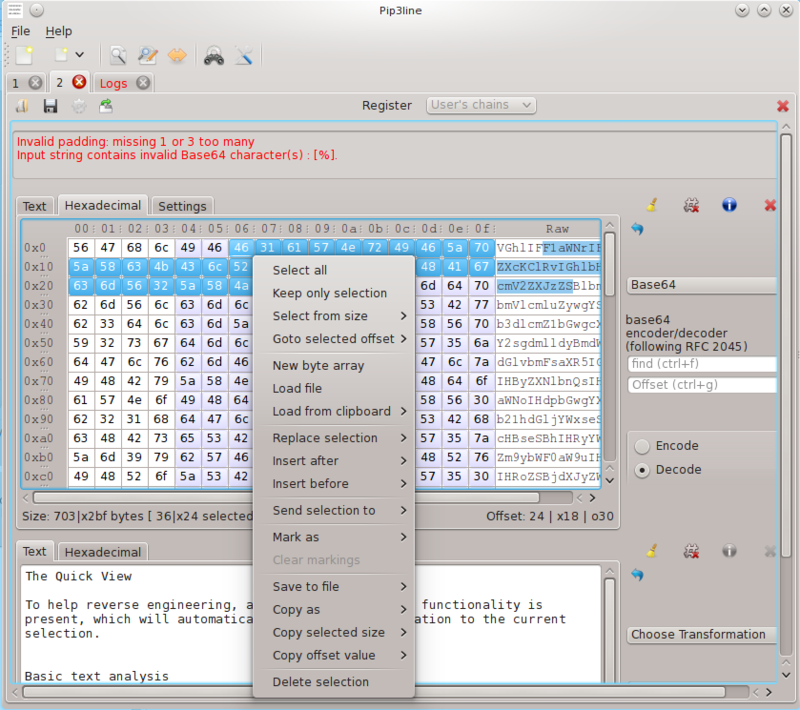 Current transformations list include classic decoders such as Base64/32/hex to simple cryptographic ciphers, and includes common hashes algorithms as well as obfuscation techniques. Easy to use, but still offering some tweaking for most transformations, it also has the ability to save/restore a configured transformation chain for future used. Pip3line was designed to be extendable and allows you to create your own transformations by using the C++/Qt plugin API. Alternatively you can just use the powerful Python 2.7 & 3 plugins to load your own Python scripts.